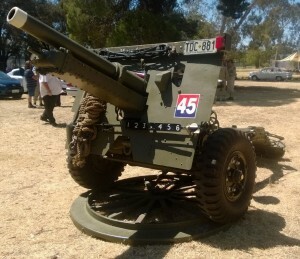 The idea of a 25 Pdr Re-enactment Gun Crew came into being in December 2000 as part of the 50th Anniversary Celebrations of the National Servicemen’s Association held in 2001. 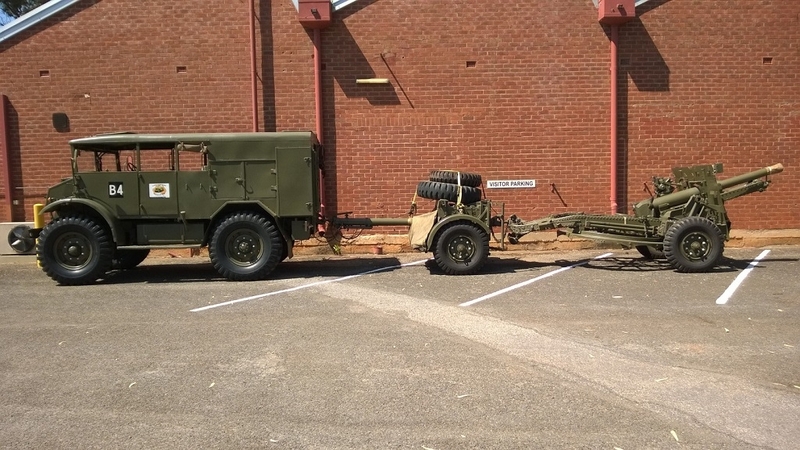 A former ‘Gunner’ and member of the Para Districts Sub-Branch in South Australia developed the idea in collaboration with the Secretary of the Military Vehicle Preservation Society of South Australia. The Gun, which a Society member made available and which was finally purchased by the crew, is permanently displayed in the Society’s National Military Vehicles Museum, Edinburgh Parks. The crew, originally consisting of ten volunteers, all from the National Servicemen’s Association of Australia started collecting uniforms from the 1945 – 55 era. It now includes volunteers from all walks of life. Two problems they encountered, were firstly the availability of uniforms from the period and secondly, the fact that the shape and size of the crewmembers has altered considerably in the 45 years since they last wore the uniforms. However, still being resourceful military types, they manage to beg, borrow, steal and as a last resort purchase, most of their requirements. The shoulder flashes are obtained from the State Headquarters of the National Servicemen’s Association whilst hat badges were ‘acquired’ from personnel currently serving with the Royal Australian Artillery. The first task was for the newly formed gun crew, to restore the gun to operational condition [blanks only]. This involved reconnecting the gun to its platform and linkages, freeing up all the long corroded parts, cleaning, polishing, lubricating and painting. Once the gun was operational drill practices started, using the original drills as prescribed in the 1942 Drill Manuals. This in itself was an interesting challenge as only half of the ten, crew-members actually served with the Artillery. The other members were from military units as diverse as Signals, R.A.F Military Police, Armoured, Infantry and Service Corps. 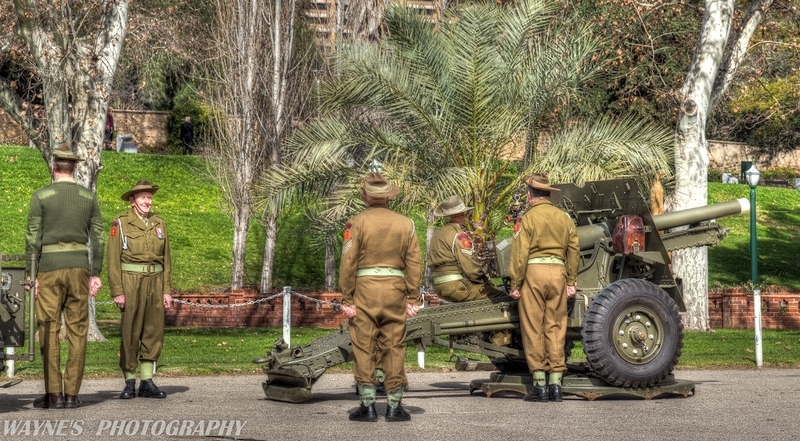 The first public appearance of the crew was in March 2001 as part of the parade in Adelaide celebrating the Centenary of the Australian Army. The gun was towed by one of the vehicles from the Military Vehicles Museum and after the parade became a static display on the Torrens Parade Ground. The display drew great interest from the public. A notable admirer was His Excellency the Governor of South Australia, Sir Eric Neal, who both complimented the crew on their effort and applauded the concept that would bring another facet of the State’s military heritage into the public eye. The first firing display took place 29th April 2001 at a Kersbrook Field Day. They have since provided ceremonials and displays throughout the state from Terowie in the north to Mt Gambier in the south at schools, local and regional shows. An interactive map of firings can be found here. The 25 Pounder Field Gun, was named after its principle projectile that weighed 25 pounds (approx 11.5 kilos) The evolution of the gun began during the First World War. In that time the main artillery pieces were the 18-pdr, which was a flat trajectory weapon and the 4.5 inch howitzer utilised for high angle fire. Gallipoli revealed the need to incorporate the characteristics of both and to increase the range. Most of the development work was carried out in the early 1930’s and by the end of that decade early versions of the 25-pdr saw active service. Through further development the 25-pdr became the principle field artillery piece of the British Commonwealth Forces and saw service as infantry support and anti-tank warfare. It was used by the Royal Australian Artillery in the North Africa Campaign, throughout Europe and in the Far East/Pacific war zones. The Guns were also used in the Malaya campaign. As recently as 1980 at least 26 countries still used the 25-pdr. In North Africa, during WWII, a 25 Pdr gun from the 2/7th Field Regt. with a range of 9 miles [13.5 kms] was used to strafe an enemy road from a hidden position; hence the term ‘Nine Mile Snipers’ was first used. Since then, members of 25 Pdr Gun Crews were affectionately referred to as ‘Nine Mile Snipers’ although some members of the infantry had less complimentary names for them. This gun, used in the displays, was built in Australia, in 1942, by the Ruwalt Industries, Richmond, Vic, it’s barrel was cast in the Adelaide workshops of CSR. Other parts were sourced from 200 different Australian workshops. Workshop facilities, housing, assistance and advice are still provided by the National Military Vehicles Museum. The Crew, together with other helpers, restored the Museum’s Australian built 1942 No 8 Ford (Blitz) Gun Tractor, [the truck used to pull the gun, ammunition trailer and carry the gun crew of six men]. Although 400 were built, this is the only restored Ford No 8 Gun Tractor in Australia. The crew continue the restoration work at the Museum, and have since restored a 1941 No. 3A Gun Tractor and 1919 ammunition trailer 2 other WWI Trailers and Paterson refreshment trailer. On 24th November 2013 the group known as the 9 Mile Snipers ceased to exist. The majority of its members were now in their late 70’s and some even in their 80’s. With an event at the Nation Military Vehicle Museum called the ‘Last Blast’ they brought to a triumphal end 13 years of good fun.